Are Rebecca and Josh finished for good? Has the Crazy Ex-Girlfriend TV show been cancelled or renewed for a fourth season on The CW? The television vulture is watching all the latest cancellation and renewal news, so this page is the place to track the status of Crazy Ex-Girlfriend, season four. Bookmark it, or subscribe for the latest updates. Remember, the television vulture is watching your shows. Are you? A satirical musical comedy airing on The CW television network, Crazy Ex-Girlfriend stars Rachel Bloom, who co-created the show with Aline Brosh McKenna, as Rebecca Bunch, a “tightly wound” Ivy educated lawyer. The cast also includes Vincent Rodriguez III, Donna Lynne Champlin, Pete Gardner, Vella Lovell, Gabrielle Ruiz, David Hull, and Scott Michael Foster. After reconnecting with Josh (Rodriguez), her summer camp crush, Rebecca quits a top New York law firm and takes off for California. She’s not following Josh though, as that would be crazy. This third season of Crazy Ex-Girlfriend picks up right after Josh strands Rebecca at the altar, in order to pursue the priesthood. Now everyone, including Rebecca, needs to figure out whether her attraction to him has veered into the arena of fatal. Meanwhile, handsome WASP Nathaniel Plimpton III (Foster) has drifted into her orbit, but he’s got his own issues. The rest of the West Covina crew are also struggling on their own road to happiness, and the issue of Rebecca’s mental health still remains an open question. The third season of Crazy Ex-Girlfriend averaged a 0.22 rating in the 18-49 demographic and 631,000 viewers. Compared to season two, that’s up by 9% in the demo and up by 13% in viewership. Learn how Crazy Ex-Girlfriend stacks up against the other CW TV shows. Crazy Ex-Girlfriend has been renewed for a fourth and final season which will debut October 12, 2018. Stay tuned for further updates. The ratings are up year-over-year so I think this CW series will be renewed. Last year, this comedy was the network’s lowest rated series in both its demo and total viewership numbers, but it snagged a renewal. CW President Mark Pedowitz credits the series’ critical acclaim and its positive effect on the network’s image for its survival. Now, the network is expanding to six nights a week so, they’re going to need more content than usual for the 2018-19 season. I’ll update this page with new developments. Subscribe for free updates on any Crazy Ex-Girlfriend cancellation or renewal news. 4/2/18 Status Update: The CW has renewed Crazy Ex-Girlfriend for fourth season for the 2018-19 season. Details here. 5/17/2018 Status Update: The CW has confirmed that Crazy Ex-Girlfriend will end with season four. Details here. TV show ratings are still important. Follow Crazy Ex-Girlfriend‘s weekly ups and downs. Find more Crazy Ex-Girlfriend TV series news or other CW TV show news. What do you think? Are you glad that the Crazy Ex-Girlfriend TV show has been renewed for a fourth season? Is it ending at the right time? If it were up to you, would The CW cancel or renew Crazy Ex-Girlfriend for season five and beyond? 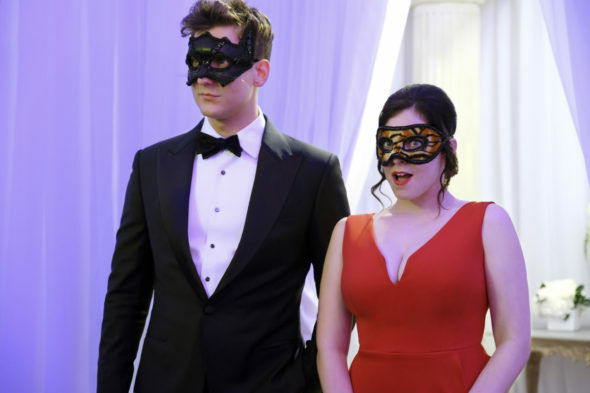 More about: Crazy Ex-Girlfriend, Crazy Ex-Girlfriend: canceled or renewed?, Crazy Ex-Girlfriend: ratings, The CW TV shows: canceled or renewed? Crazy Ex-Girlfriend: Has the CW TV Series Been Cancelled or Renewed for Season Three? PLEASE don’t cancel this show. It is so good, so different and such talent and good acting. I love the singing and characters, especially Rebecca, Paula and Nathanial. ALL are good! I love this show… binge watched it for a few weeks on Netflix… I need season 4!!! Please don’t cancel this show! Please please please renew! I love love love this show!!!! I AM LOOKING for more nathaniel and rebecca scenes pls pls pls have season 4! Please renew this series! I LOVE it and I am not a normal TV watcher. Besides Grace and Frankie, this is the ONLY series I look forward to. This is the best show I’ve ever watched, and I’ve been worried since its inception that it would be cancelled like most shows I’ve loved. I’m thrilled it’s hung on, and I’ll be devastated if the showrunners can’t complete their four-season plan. Just one more season, CW! I must see what happens! The show has been renewed with Atrocious Ratings before. It will be renewed with Atrocious Ratings again. It is an embarrassment to network Television. It is probably the WORST rated show in Network Television History to stay on the air. I do not care, this show is totally amazing it’s one of the best shows on tv right now I wish people pay more attention to it. I wish all the people who had shows with ratings that destroy this show yet still had their shows cancelled would come give you a piece of their minds. Ignorance is only bliss to those who are Ignorant. Worthymagic. Ratings are different then viewing figures. Critic wise CEXG is doing amazingly well. People just aren’t watching. Before you sprout off about ignorance try not to get confused between 2 very different words. Four words: Award recognition & Netflix deal. Renew please! You can easily fall in love with every character. The characters are all so different but blend so well together. I love the music and choreography that goes into the episodes. I think it puts a unique upbeat spin to it. I am crazy and addicted to this show watched the whole three seasons with joy never got bored. If it is to be cancelled, my heart would be broken. Guess people who don’t watch this tv show like to put themselves down with the other super dramatic TV shows as this once is super cheerful and super interesting. I love this show and will be devo if it’s cancelled. It’s the most interesting, funny and entertaining show with important themes that I have enjoyed in years. It was announced this morning in the New York Post website that Rachel Bloom will be on Broadway this fall in musical Crazy for You in New York City. How can she be in both CrazyEx Girlfriend and star on Broadway? They could start filming this debacle in a month or so(since the season is almost over) or they could wait until next winter and start filming after she is finished with Broadway. The show would run late, but it’s not like that can make the ratings any worse.